I was told to be at Paddington Station by 8:30 for my 9:00 train. Not wanting to risk issues with the tube and other possible delays, I left my hostel at a little after 7. According to the Transport for London site, that departure time, when factoring in walking and transfers was supposed to right at an hour, so I expected to have time to spare, but I’m not sure how the journey only took a little over 30 minutes (I guess I caught an earlier train at some point?) – regardless, I had LOTS of time to spare before I caught my train to Bath, so I spent some time wondering around Paddington Station – and what do I stumble upon, but Paddington Bear himself. As it was just about time to board,I realized this would be my 1st long train ride, at least as an adult. It’s a good thing I liked it, or the next few weeks might be rough. I was pleasantly surprised at the comfort of the train and the lovely scenery I saw. Windows make pictures difficult, but I did have some fun with iPhone panoramic photo fails. 🙂 the scenery was pastural, particularly between Chippenham and Swindon. I’m already planning my next journey – I absolutely have to explore more of the UK. I just love it! Upon my arrival at Bath Spa station, I decided to start by exploring the city a bit on foot. I immediately felt like I had stepped back in time. As a UNESCO World Heritage City (and the only whole city in Britain) it is very clear that substantial architectural controls and regulations are in place. All buildings that are constructed must be faced in Bath Stone, a soft stone mined nearby, with few exceptions. 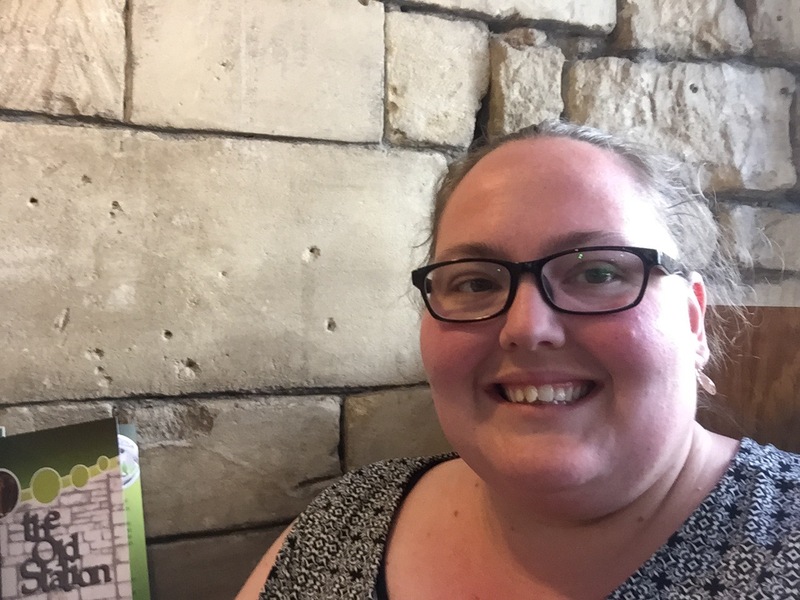 My tour included the train to and from London (with a seat reservation), a tour of the city of Bath, a skyline tour in surrounding areas, and admission to the Roman Baths, so I had planned on a jam packed day. My journey into Bath was a direct recommendation from the Basford Family. I remember a conversation that took place several years ago at the Basford dinner table about places I wanted to travel to, and at that time, I really only mentioned London in the UK, and immediately Tessa listed several other places I should visit, Bath being one of them. What followed that was a recounting of Katie’s love of Bath, a pulling out of a photo album and Katie’s story of Wayne tasting the “Spa Water”, and lots of laughter. (Even after being warned I decided to try it too, (I guess it is like Beverly at the World of Coke?!?) and YUCK. I’m not even sure how to describe the taste – like hot ocean water with sulphur? But,when in Rome, or in this case in Aquae Sulis? I decided to start with the tour, but because I had been walking around I missed the 1st part of the commentary and joined a later stop, and honestly, the tour guide wasn’t very good, so I got off rather quickly and decided to wander a bit more, and I stumbled into a boules tournament in a Central Park area. Boules is like bocce and was quite fun to watch. After this I decided to go ahead and do the tour of the Roman Baths. The history was fascinating. I was in absolute awe of the artifacts and excavations on display throughout the site. My admission included an audio guide, and even though I’m not usually a huge fan of those, I enjoyed the commentary throughout my journey. It was absolutely fascinating. What’s even more spectacular is that they are still continuously working to excavate the ruins and are finding new roman ruins throughout Bath all the time. The science geek in me was totally enthralled by the dating, validation and examination of these artifacts and how that knowledge continually shapes the knowledge we have about the Ancient Romans. After I left the Baths I felt like I had visited a little part of Rome, which was really exciting since that isn’t a stop on my travels this trip. As I was leaving the Baths I stumbled upon this great Tapestry – I hate I couldn’t get a better picture, but Mike Green, I thought you would enjoy this! After I left the Baths, I decided to explore the immediate area surrounding it, including the Abbey right next door, a gorgeous abbey, and quite historical location. It has been rebuilt and modified many times through the years, but has continuously been a location of worship. It holds historical significance as the location of the 1st King of England’s (Edgar) coronation location. The Abbey’s exterior was stunning, but I did not get to journey inside, as it was closed for a funeral. After ducking through quite a few quaint and lovely roadways that truly made me feel like I had stepped back in time, I decided to give the tour bus another go (I do typically enjoy the little stories and facts that the tour guides share). This time it was much better – and the tour guide was fabulous. I rode through through the entire loop with him, learned tons and made some really spectacular pictures. When I got back to the starting point I disembarked, happily tipping him on my way off the bus. At this point I decided that I should search for something to eat, which lead me to a quite touristy location in Sally Lunn’s. Sally Lunns is a famous eatery and one of the oldest homes in Bath. Originally I just stopped in to get a bun to take back with me, but was enticed by the smells from the cafe, so I decided I’d stop there. It was so yummy!! The had a large menu with sandwiches and teas and pastries, but I decided that protein and vegetables would be a good choice, so I went with the lunch special, a pork loin trencher (meat, vegetables and gravy on top of a half of a bun – the bun is supposed to be a trencher, or substitute for a plate). What I didn’t realize was the amount of food this £10 special came with. Goodness Gracious. It came with soup, an entree, desert and hot tea. I was glad it was a late lunch, because it was certainly going to be a combined lunch/dinner, and even at that I got the dessert to go. Sufficiently full, I wandered around some shops and streets in Bath a bit more (wow at the glass blowing – thanks for the recommendation Rachel!) before boarding the skyline tour, which promised views of Bath you wouldn’t be able to see on foot, and I quickly discovered why. Bath seems to be set in a valley, and as we journeyed outside the city we climbed up for some amazing views of Bath, surrounding towns and the Cotswalds. So gorgeous. The tour ended right by the train station, but I still had a bit of time to kill, so I decided to grab a coffee from a local coffee shop, and I was not at all disappointed. 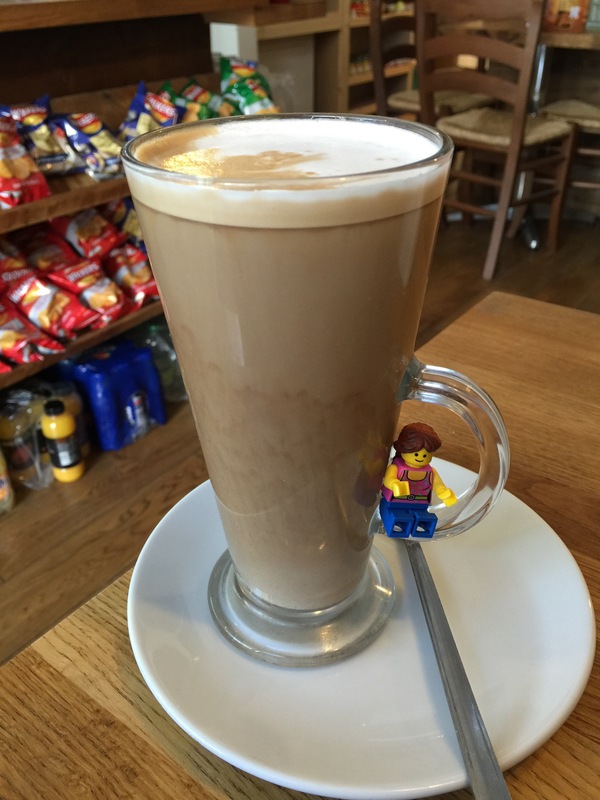 As #minifigmerry shows – it was a large, and quite yummy latte! After I drank my latte & enjoyed the free wifi, I headed for the train station to catch my return train to Paddington Station. Guess what train journeys are good for?!? Drafting a blog post while you look out the window. I’m typing this on my phone now, and will put it on my computer with pictures when I get back to my hostel. All that said, I am now back at the hostel, and finished uploading, and I may come back and label pictures more later, but I must get some sleep! More London adventures tomorrow – including the Harry Potter Studio Tour! Wow! What beautiful pictures!! Merry, I am so envious but excited for your journey!! Keep on posting!! i enjoyed seeing the tapestry at Bath. The tour through your images was very nice. I was happy to see the Bath Crescent. This figures into a lot of Regency novels. Thanks, Merry! Your touring is fabulous! Awesome! So glad you had such valuable tips from the Basford household! I’m loving reading your journey through my past!!!! I am so grateful to be able to enjoy and learn from your journey vicariously. Please keep the glorious photos and commentary coming because, as I said earlier, I see a travelogue in the making! Previous Previous post: Day 2 in London ~ Royals, Exploring London, Artwork, Portraits, Worship and More. . .